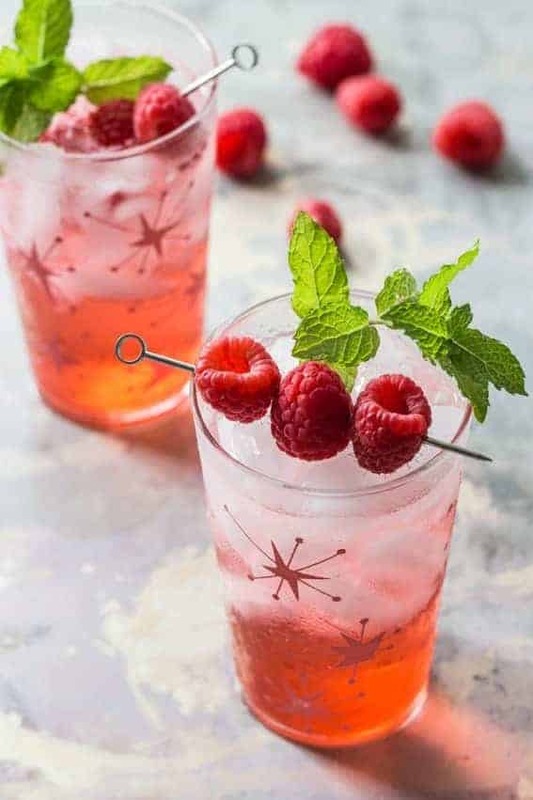 A Raspberry Shrub is the perfectly refreshing way to use up languishing fruit. Bright and tart, it’s great for adding to cocktails or just club soda for sipping on the porch in a summer breeze. Emily’s here to share a new recipe with you while I spend some quality time with Eric and Elle in Florida. We’re soaking up rays and drinking in the beautiful ocean breezes – and I’m sharing some epic sunsets on Instagram. 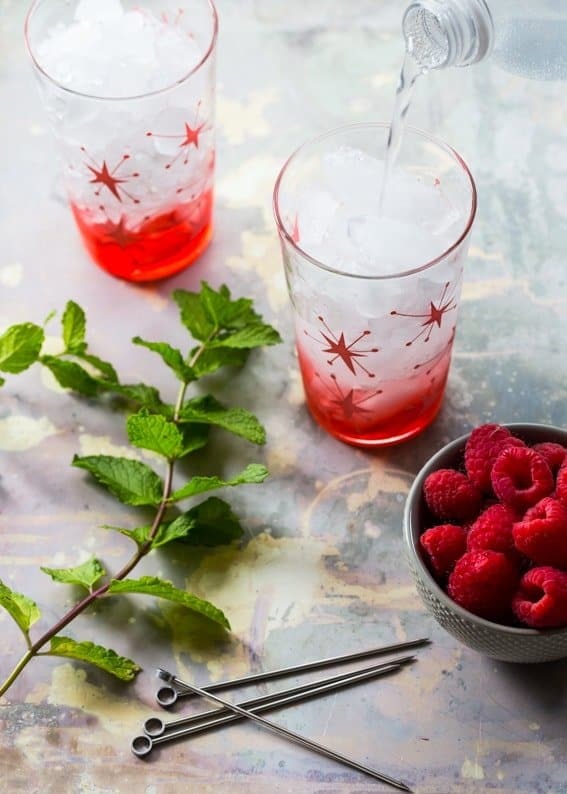 Drink up something of your own – this fantastic Raspberry Shrub. I know you’ll love it, and plenty of the other drinks on Emily’s blog, Jelly Toast. Thanks for having my back, Em! I am the queen of impulse buying fruit. When I’m at the store, I tend to buy a container or bag of whatever type of fruit is currently in season. This means that for about a two-three week period my family is bombarded with berries, peaches, apples, plums – whatever is there. I tell myself that my family is a fruit eating machine – which isn’t untrue – but I seem to get selective amnesia about the fact that when I throw too much of the same thing at them for a long period of time, they totally rebel. I blaming my family, but honestly, I’m the worst one of the bunch. One of the most recent victims in our house has been raspberries. Man, when they were on sale I could not buy enough raspberries. They were plump, beautiful, and good on just about anything: pancakes, yogurt, cereal, and salads. Well, at the tail end of our raspberry immersion, I had two clamshells of raspberries chilling in our fridge not being touched. Every time I reached over them to get the milk, I felt them giving me the side eye. Enough was enough. I had to do something with these berries before they just got chucked in the trash. I do not enjoy wasting food and I knew just the thing to do with these raspberries before the end of their run. Have you ever made a shrub? It’s basically like preserving your fruit with sugar and vinegar and turning it into the most incredibly sweet and tangy drink mixer you’ve ever tasted. Shrubs have a long history and began to do just that: preserve fruit before it spoiled. Fruit that is too ripe to do anything else with is the perfect fruit to turn into a shrub. Think how good brown banana are in banana bread. It’s the same thing with a shrub. You take your ripe fruit (although be sure there isn’t any actual mold or anything on it. If your fruit is moldy, there is no saving it at that point) and mix it with a good amount of sugar. It is pretty much a one-to-one ratio, although for this recipe I increased the amount of sugar a bit knowing raspberries tend to be a bit tart. The fruit/sugar mixture hangs out in the fridge for a few days. Ideally about 3, although I left mine in for the better part of a week and it turned out totally fine. What you have at the end of the time is a thick, sweet fruit simple syrup. Strain out any of the fruit solids and stir the vinegar in with the sugar mixture to complete the shrub. I have kept my shrub syrup in the fridge for over a month and it just keeps getting better. 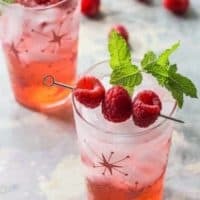 The vinegar flavor becomes mild over time and a few tablespoons of shrub syrup mixed with some club soda makes an incredibly thirst quenching drink on a hot, humid day. Don’t have raspberries on hand? This method works with many different kinds of fruits. Peaches, blackberries, strawberries, plums – the list goes on. Next time you have some forlorn fruit spending time in your fridge, give a shrub a try. Combine raspberries and sugar in a glass bowl or lidded container. Stir to combine. Cover and refrigerate for 2-5 days. Use a fine mesh sieve and strain out all raspberry solids. Discard solids. Mix raspberry mixture with vinegar and stir well. Transfer to a 1 quart mason jar and keep refrigerated. Fill a glass with ice. 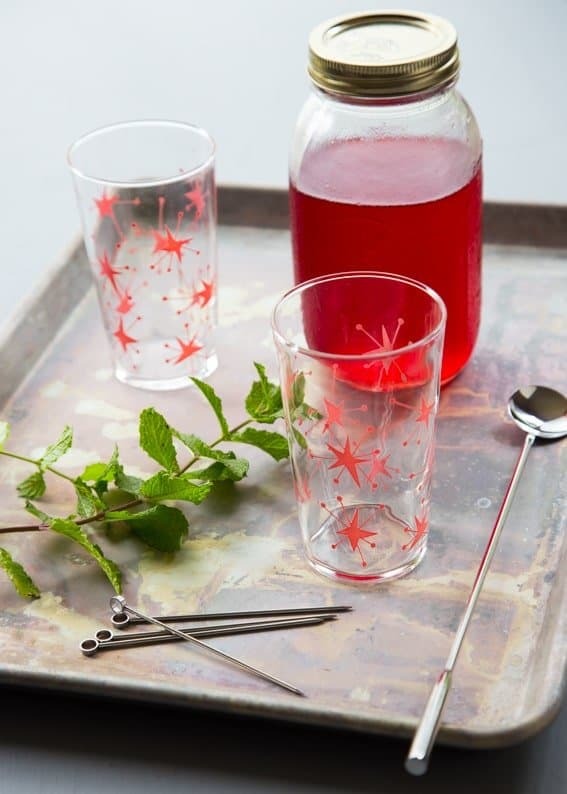 Add 3 tablespoons (or to taste) of raspberry shrub syrup to the glass. Top with 6-8 ounces club soda. Serve and enjoy! This sounds refreshing! The vinegar is an interesting twist but I’m sure the Club Soda helps out :) If you were to suggest a way to make this into an “Adult Beverage” what would be your recommendation? I have some raspberries that are slightly too ripe and this looks perfect! 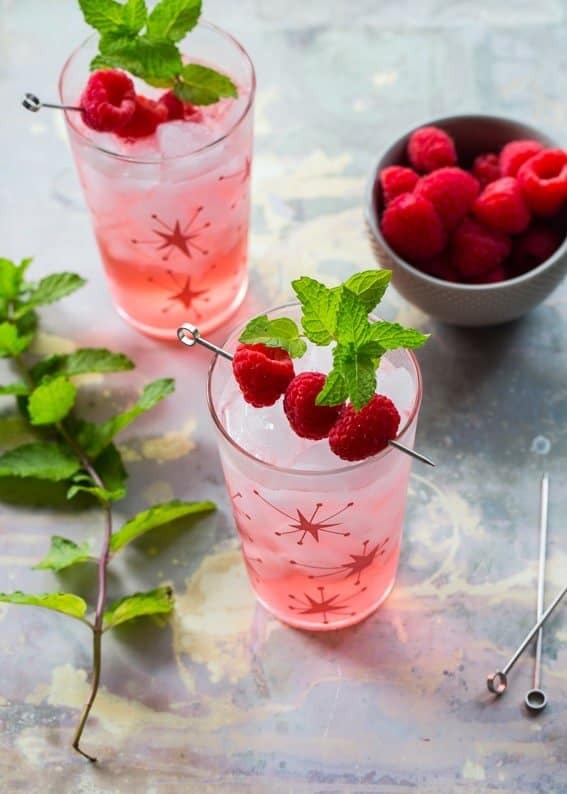 Love the fresh and sweet flavors in this drink, also the pink color is a winner, and those cute glasses are a must! Yum! I bet this makes a great soda (or cocktail)! So, I tried out the recipe, but the vinegar seems to overpower the raspberries. Any suggestions? Hi, Alicia! The vinegar taste will become more mellow with time. Leave the shrub for several weeks, and the vinegar taste should become more mild. Good luck! Hi, the sugar stuck to the bottom and the raspberry juice floated on top, am I supposed to discard the sugar or mix it with the vinegar and raspberry juice?